There’s no easier way to bring drama to a space than through a giant removable wall mural. This post includes affiliate links. Please see my disclosure page for more information. Ginormous art makes a ginormous statement in any room, but not everyone wants a permanent piece of art on their walls. With my husband in a different city for his new job, he is staying in a temporary apartment rental. It’s hard to be away from home while we wait for school to get out. That’s why he’s been fixing up his temporary digs with inexpensive decor so this summer we can spend our time with him in a cozy apartment. Removable wall art was a no brainer for adding art and impact without adding holes to the walls. For the kids’ room, it is sparsely furnished and decorated. We are planning to spend several weeks this summer visiting but for the most part the room won’t be used much. So we felt like this room could be extremely imaginative. 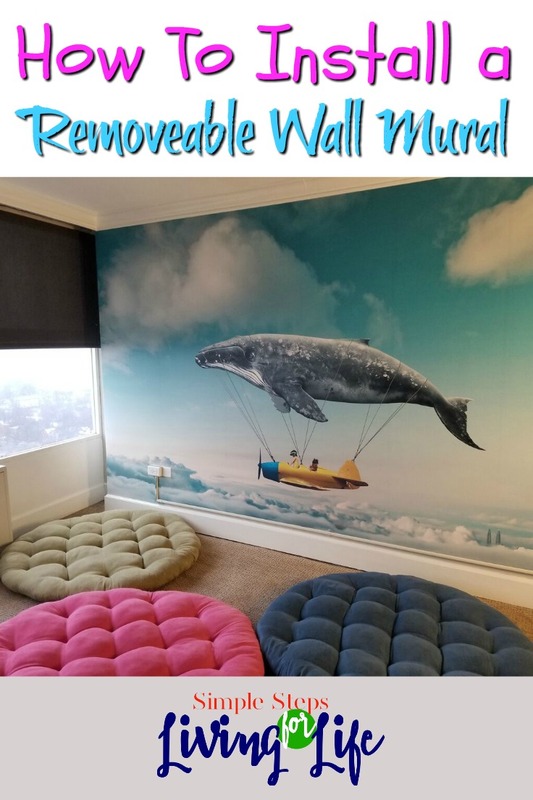 For “beds” we used papasan mattresses which I have a dream of making slipcovers in white so they would look like clouds to go with the dreamlike airplane and whale mural. 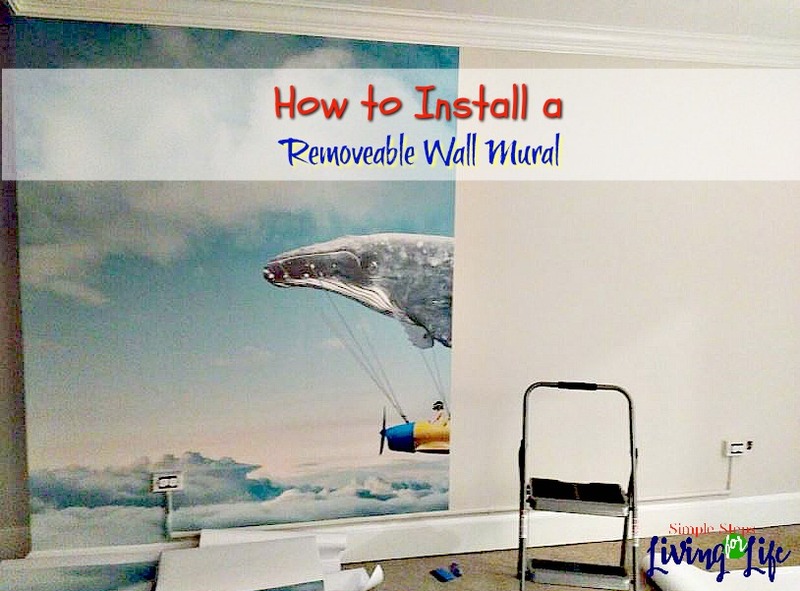 Below are helpful hints on how to install a removable wall mural. 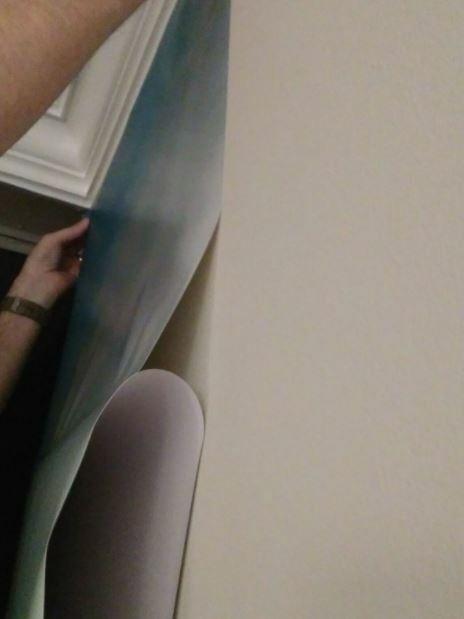 Measure your wall and space you want to cover. I know you probably know that but really measure the space you are wanting to cover before ever ordering. There are many different sizes you can choose from 66″ x 96″ (4 pieces that are 24″ x 66″) or 100″ x 144″ (6 pieces that are 24″ x 100″) All of the murals my husband selected are the larger size. Although we didn’t need quite all of the height of the mural, I think it looks best when it can cover the entire height of the wall. Make as much space as possible around the wall to work and gather tools. It’s best to be able to have a spot to unroll the pieces and have tools ready. The tools that we used were a removable wall mural, a stepladder, a tape measure, a retractable utility knife, a level, and a smoothing tool. 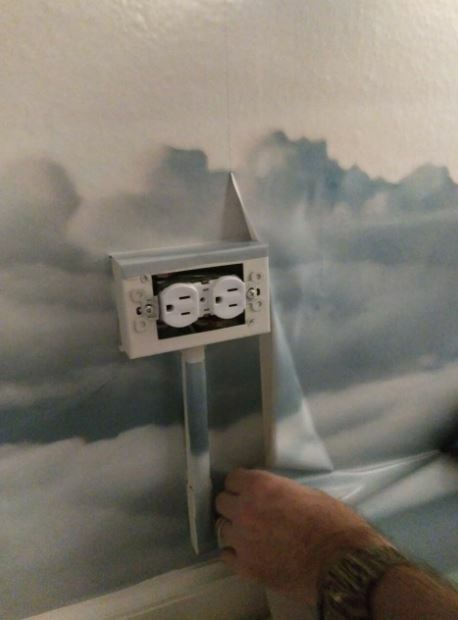 My husband had set up 3 previous murals and with one of the packages the smoothing tool was included. We aren’t sure why it didn’t come with all the murals but regardless it was helpful to have it. Find the perfect place to start. Either start with piece #1 starting from left to right or start with piece #6 from right to left. Measure the wall area and determine the best placement depending on the size of your mural in relation to the size of the wall. For our wall, the best place to start was the beginning of the wall. It was helpful that the most ideal place for the top of the mural was where the ceiling and wall met. Attach the first piece starting from the top. Put the ladder in place and before climbing up, remove the backing at the very top of the piece. Adhere the top of the piece and make sure that as the rest of the piece hangs down that it is level. If not, remove the very top and try again until it is as level as possible. Once this is level, hold the top of the piece in place and start pulling down on the backing. Smooth the mural piece from top to bottom as backing is removed until you get to the bottom of the wall or mural whichever is first depending on the height of the wall verses the height of the mural. Another hint is to not just use your hands to smooth the piece to the wall but use the smoothing tool to remove bubbles as you are removing the backing. Work around electrical outlets. My husband tried to make these blend as much with the mural as possible. After removing the backing near the electrical plugs, he would cut around the box as much as possible. 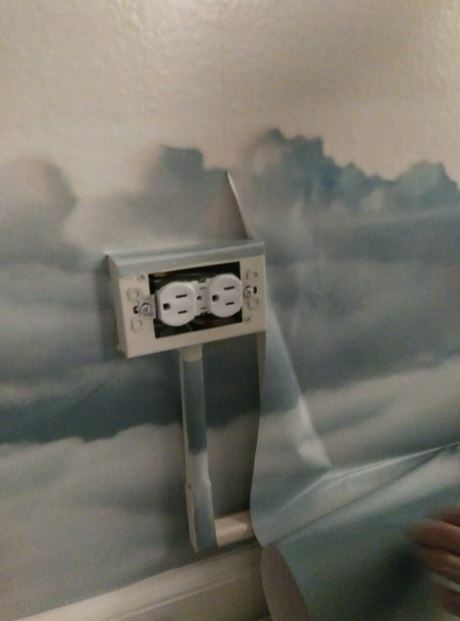 The electrical boxes were wrapped with the mural pieces that were leftover at the bottom of the panel because the panel was taller than the wall. Attach the remaining pieces. 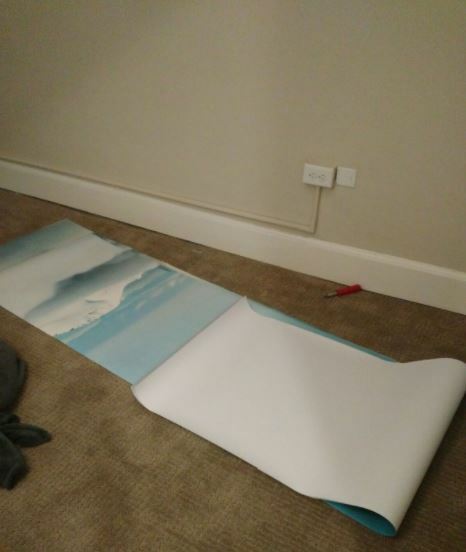 The instructions said that the pieces should be overlapped about 1 inch. Start by adhering the top of the mural piece as described in step 5. 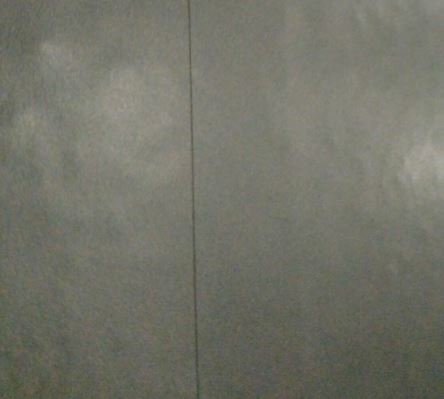 With the rest of the backing still attached, make sure the images on the mural are lining up. Finish removing and attaching all the pieces as in step 5. 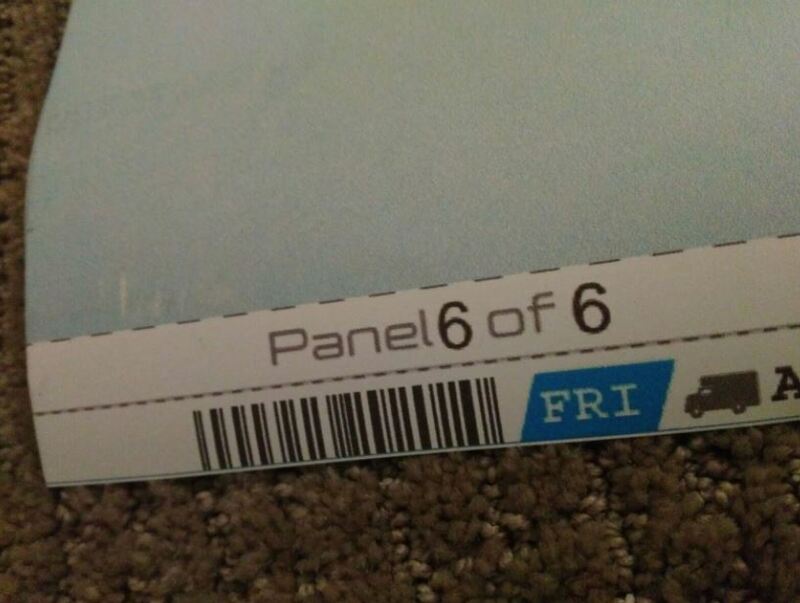 Here is an example of two pieces overlapping… it doesn’t matter if which piece overlaps each other as the artwork is printed to the edge and made so that the one inch overlap will work either way. We’ve really enjoyed the murals we added to each of the rooms in the apartment. I’ll be highlighting the way we’ve decorated this fancy smancy place in the weeks ahead on the blog. It was fun to shop online and brick and mortar stores for just the right pieces. Click here for more HOME posts.